Happy Hump Day! Hope everyone had a great Valentine's Day. Today's card is for the second Challenge at Craft a Scene. They want you to create a Winter scene. I was the lucky random winner of their very first challenge and received a envie with some goodies including the glossy card stock I used on this card, thanks so much ladies. 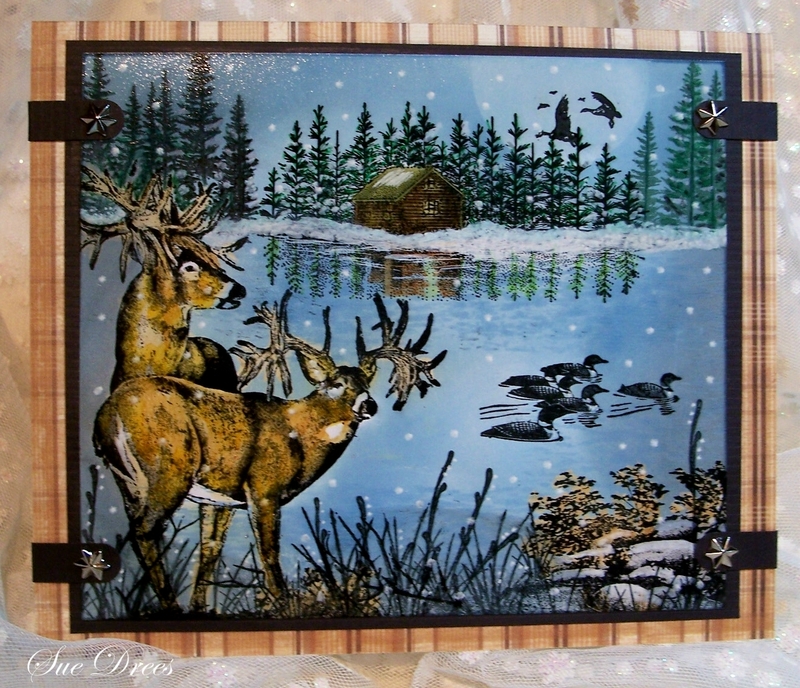 I created this scene showing two beautiful deer, Rubber Cottage Stamp making a night time visit to the lake. All other stamps used are Stampscapes. Inks used, Marvey Matchables, and Ranger Distress Inks. Matted on Black card stock and DCWV designer paper. Stars are from Hobby Lobby. Man, you are the Queen of Scene! Gorgeous scene!! Fabulous combination of stamps. Fantastic! I did'nt know you could do this. 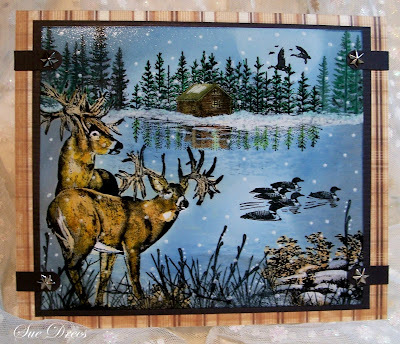 I saw this on the blog, really pretty scene and your coloring is wonderful on the deer, great shading. 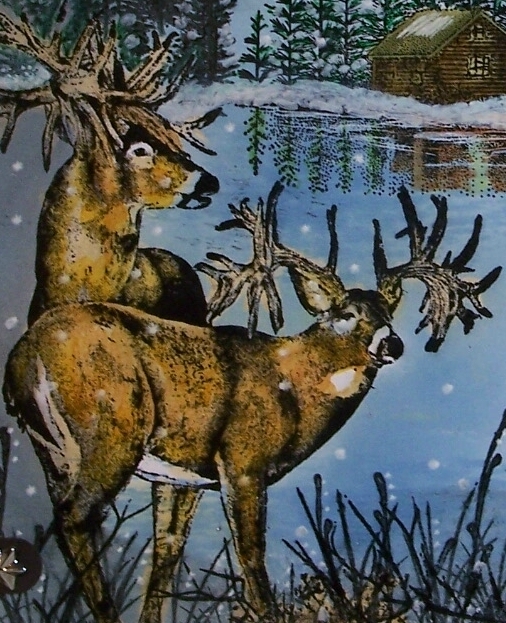 Love the colors on the deer..beautiful scene! Amazingly beautiful. I see Sue said you were the Queen of Scene and I second that. The scene is gorgeous and your little star embellishment just add the perfect little touch to the overall look. Keep these scene coming. I so enjoy seeing them. Have a great day, my friend. wonderful.. I want to see more natural scenes from you dear Sue! 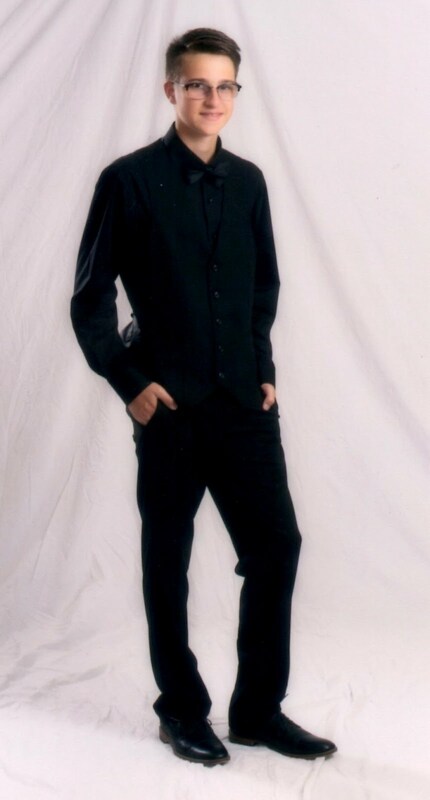 Gorgeous masculine card. Love the image and fabulous coloring. oooooooo this is gorgeous sue I love landscape cards. I keep looking at it! It is beautiful!!! Thanks for joining us at Craft a Scene!! Stunning card Sue, love the scene, what fabulous talent you have! you leave by me a great comment about my drawings but you can also make beautiful cards with those amazing stamps. just like the card with the wolves. it is so great to see how your colour work is. it is wow!! oooo...what a beautiful stamps so good combined!! hum....if you don't have a place to send this card, you can sending it to the netherlands to me,hihi. just kidding. I said it, just know how stunning this is. This is downright amazing! Love those deer! WOW! Your card is totally awesome. I love your coloring and the way you designed the scene. Those deer are amazing. I also love how you made the scene look so glossy. Wow!! What a gorgeous scene!! Your colouring of the deer is perfect..all of it is perfect! Oh Sue, this is dazzling!!!! Can I live there??? How serene and stunning is this!!! I love the lake effect, the reflection and wow, I think this is amazing!!! I hope you had a lovely, loving valentines day!! Sue, this is a wonderful scene. Excellent layout and fabulous coloring. The added snow is just the right amount. Good luck and thanks for joining in on the fun at Craft A Scene. OH MY GOSH, the detailing and coloring is incredible. WOWWWWW!! What a great design. Love it.